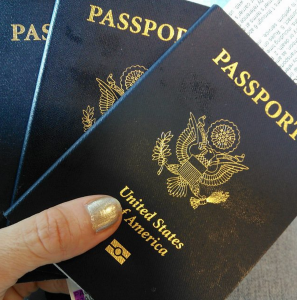 Are you considering taking a vacation or a business trip? Florida is one of the world’s greatest cities for a vacation; you will never be disappointed when it comes to some time away in Florida. However, regardless of where you choose to spend your vacation, being comfortable is what defines a real vacation. Many people are adapting to the concept of vacation rentals. What are the benefits of Vacation Rentals? Avoid the hustles of booking a hotel and the disappointments of substandard room service and allow yourself to have a home away from home experience by getting a vacation rental. Even when on a business trip there is the provision of opting for the corporate stay. The advantages of vacation rentals and corporate stay accommodation facilities are so many to be enumerated on paper. Albeit you are wondering why someone would go through all the trouble to furnish an apartment only to rent it out at a fee; well, it goes beyond money. The need for privacy and peace when on a vacation is what has driven the need to create alternatives to hotels for those on vacations. Picture being on a family vacation and you get to live in an apartment or a condo specially set aside for you and your loved ones. The beauty of a home cooked meal and the convenience of having everything at your reach is simply the final touch to your vacation plans. On the other hand, if you are on a business trip, the idea of conducting a meeting in your apartment, away from the noise and in a manner that is convenient for you is the advantage of booking an extended stay or a corporate stay apartment. As if these are not enough, having this all-inclusive setting is cost effective as opposed to staying in a hotel. This kind of setting gives you the privilege of having your family close to you even when working away from home. If you choose to visit Florida there are so many places to choose from like Ellas Vacation Rentals. Allow yourself to enjoy all that Florida has to offer without fear of impending bills in a hotel or having to eat out every single day. All you need is to get a vacation rental. Many companies and business executives are slowly making the transition from hotels to vacation rentals. Do not be left out in this paradigm shift. Join the wave and allow yourself to get a totally new vacation experience. Make memories away from home while at the same time; get the comfort of staying in an environment that reminds you of home. There is so much that Florida has to offer and at the same time there is so much that you can benefit from when it comes to vacation rentals, corporate stays or extended stays. Get enlightened and choose what is best for you, but allow yourself to explore comfort at a totally different level. Choose to embrace your own personal space and choose to have the liberty to do as you please when on a trip by going for vacation rentals. It is value for your money and a decision you cannot regret. I just added a new Bed & Breakfast in Cape Coral, called European Stop to my site and very happy about to offer it now tot he travelers. Here are my thoughts of today on the Benefits of Vacation Rentals. Pinterest is fascinating. I personally called it Lazy Blogging. Pin – Pin – Pin. It calls for my creativity. As a passionate photographer, I can finally show the world my creations, even if it comes in the form of rooms/suites/houses and product photography. In modern day and age, most artist can’t spend time painting or drawing. Work takes a major part of our lives. I love what I do and I do not consider what I do as a work. I love people, I live photography and I love travel. Special thank you to my 10th follower @petervonstamm Peter von Stamm, an amazing photographer from Berlin. Like from any other social media advertisement plant form, my main intent, believe it or not, is to make friends. Being a nerd, it is my personal outlet of human interaction. To me, Internet is just like a travel, but on the cyber level. 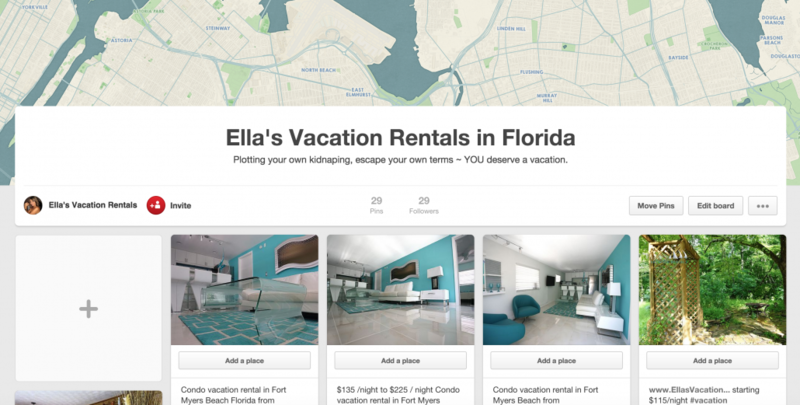 Welcome to Ella’s Vacation Rentals on Pinterest. I am very excited about my first 29 followers. Just to make more fun with it, I am offering 15% discount to my 777 follower. Please contact me with PromoCode: Pinterest777 Who is my lucky winner? I welcome everyone to my new page! I admire authentic cuisine. Often, I travel just to go to the restaurant and have a meal. My favorite places were France and Turkey when it comes to the restaurants. I just have discovered the new destination, which is only 3 hours away via American Airlines, going from Miami. Las Bovedas Panama City was on the list to visit. There were many choices, but the historic aspect of the restaurant was a definitely an attractive feature. Traveling for many years, I got very picky. When I arrived to La Bovedas, I was pleased with the decor. It reminded me my home town in South Russia. The walls were made with nicely colored real stones. After living in America, the world of artificial and plastic decor in majority places, I could finally breath and enjoy the decor and the quality of the surroundings. The red covers on the tables was a great color to pick and was calling my hunger. Also, I was very pleased with the selection of wines from Argentina, France and other places that I normally choose my fine wine from. The menu has a lot of options for sea food. I was guilty for eating not long ago my lunch at Lebanese restaurant, which was crap. I assumed I would not be able to eat my dishes at Las Bovedas. To my surprised, I finished two appetizers and most of my shrimps, that I topped with a fine cup of cappuccino. The presentation was a state of the art. All the dishes were decorated as if the artist put his hand on it. All the dishes arrived on time and when needed. The service was above average. I love sea food and vegetables, covered in souses and oils and spices and other yaminess. Bring me my food and I will indulge myself in its taste and aroma. The owner of the restaurant, Las Bovedas Panama City, stopped by and said hi to us, telling us a bit more about the history of the restaurant, which I can’t wait to write only travel blog. It is a definite place t return and I highly recumbent to all the visitor to taste the luxurious dishes at Las Bovedas Panama City. Of cause it a a ritual to finish every of my meals with a fine made Cappuccino. I needed my energy for the crazy night life that was planned at the local clubs … The taxi driver was waiting for us nearLas Bovedas Panama City to drive us around all night long, club hopping with partying with friends… I do not have the pictures of that night, for the camera was the last thing I had in mind at that moment of passionate Spanish adventures.. In the morning, the early short flight was taking me to the Islands to recover and to new exploration and joy of life. I can’t wait to go to Las Bovedas Panama City on my next visit to Panama. Living my entire life is fast paste life, I often found South Beach Florida as a must stop destination even if it was for a day swimming or an evening dinner. Normally, I would head out to Caribbean, but this time it was South America. Last minute reservation at Betsy was a great pick. The trip to South America was spur of the moment and the hotel looked lovely online. The place is beautifully decorated with an intimate feel. The staff was courteous, friendly and well dressed. The location was perfect, right on Ocean Drive, steps from the park and beach, but several blocks away from the noisiest, most congested part of the deco district. The rooftop deck offers a great view, again away from the crowds, perfect for early morning coffee or an evening cocktail. Most of my South Beach Florida stops were last minute decision, hotel wise. All of them were unique and beautiful. Betcy was perfect because it was a calm and classy place, which did not bring up the urge to party, like I normally do when I am in South Beach Florida. This time, I had to safe all my energy for my up coming trip to South America. “Situated at the edge of the Atlantic, The Betsy – South Beach is a refined, beachside haven located in the heart of South Beach and the only Forbes Four Star and AAA Four Diamond boutique hotel on Miami Beach” – taken off the Hotels Website. I always have a great lunch: French Onion Soup and Ice Cold Beer on a Hot Summer Day. The bathrooms at the place are great design wise. It is always fun times trying to figure out how are the sinks work after a few beers. It is a definitely a conversation ice breaker! The theme is the legacy of Henry Ford, who wintered with Thomas Edison in Ft. Myers. The burgers are very good and are named after prominent people from the area. I love food, I love those excellent burgers that they serve! The burgers are huge! Ford’s Garage Sports Bar is a very unique place. I love the atmosphere and decor of the Ford’s Garage in downtown Fort Myers. Our service was very good; the waitress was attentive but not intrusive. Some times, I order lobster mac and cheese that is delicious. On occasion I bring my friends there. My dining companions were similarly pleased with their meals. Old Marco Lodge is located right on the water. It was a beautiful boat ride towards it. An ice cold beer in hand, fresh , warm breeze of Gulf of Mexico waters… what else one can wish for? It is February right now. Many states and countries are covered in snow. What would you give right now, just to be in my place? Old Marco Lodge was built in 1869, the historic Lodge was relocated to its new home on January 4, 1965. Old Marco Lodge is good to visit at any time, the daytime or at night and have the time of your life. During the day time, the lunch is quite and somewhat private. Its is perfect for big families or a romantic couples. If you to park your boat in the evening, you can enjoy the sunset. The restaurant is spacious and a lot of seatings a re located outside under the huge umbrellas. There one can experience the feeling of the breeze from the ocean in Goodland Bay and from the Marco River.. In the evening there is music and dancing, a great entertainment! I strongly suggest every one visiting Old Marco Lodge while traveling to Florida. It is the place to be! As I was driving across Canada, I arrived to the city called Ottawa. I was fascinated with the surroundings. It was fall and every single tree was bright yellow or red and every color in between. It was so beautiful. The architecture was impressive. The over all culture was very unique. There is no way I could describe it all in one article, so I decided to concentrate on the Museums. Even at a time when knowledge is easily shared through Internet, museums are privileged places where anyone can come into contact with art, culture and history. They can be educational, fun and interactive, and present exhibitions that may attract several age groups. If you are planning a stay in Ottawa in the coming weeks, consider adding a visit to some museums in your schedule to gain new knowledge in the heart of Canada’s capital. Ottawa brings indeed several renowned museums such as the Canadian War Museum, the Canadian Museum of Nature, the National Gallery of Canada, the Canadian Children’s Museum or the Royal Canadian Mint. Depending on your interests and the time of your trip to Ottawa, you can plan a visit to one or more exposures. The Canadian War Museum is an audience favorite. It tells the military history of Canada through various exhibitions featuring the country’s role in various international conflicts, and perspectives of soldiers and civilians. In addition to its permanent exhibits that showcase several military artifacts and art, the museum presents various exhibitions, such as “Eleven women facing war”, a photographic exhibition which tells the lives of 11 women from from different countries. The exhibition will run from February 8 to 21 April 2013. The Canadian Museum of Nature, for its part, is a natural history museum that has a mission to help people better understand the nature and the respect in order to live in harmony with it. The museum’s collection is one of the finest in the world, and includes more than 10 million specimens that trace the history of our planet. Among the temporary exhibitions, “Nature unleashed – the heart of natural disasters,” presented until May 5, 2013, to discover the power of nature. The Museum of Fine Arts of Canada holds a treasure: the largest collection of Canadian art in the world. The exhibits in the museum are designed to introduce the art and visitors to reflect on the past, present and future. Among the exhibitions in progress, “Beauties monstrous” presented until March 10, 2013, shows representations of real or fictional monsters related to religious and mythological concerns of their time. To heighten the interest of the smallest, a visit to the Children’s Museum is a must. The museum is located inside the Canadian Museum of Civilization, is the only for children from 0-14 years in the country. The permanent exhibition is a village representing countries, which allows to explore and learn while having fun. Several temporary exhibitions and activities are presented as “Handmade Fun!” A creative workshop with various themes. Finally, the Royal Canadian Mint will help you discover how the metal is transformed to become the coins that are part of our daily lives, and even touch a real gold bar!